be the case for this winters event as well…. Already, the winter of 2015-2016 is being built up as one for the books. Well regarded media sources such as the Washington Post, in a recent article, are indicating that not only is this winter looking to host an El Niño event, but that ‘it could rival strongest in recorded history‘ and the SFist is dubbing it ‘The Godzilla El Niño‘ . But still, we’re all in the same boat: WHAT DOES IT MEAN FOR SNOWMOBILERS? I think this image gets posted every year. I wonder what year it was actually published? As long as I’ve had a Facebook account, each August, I start seeing this same image. I would go so far as to say that it gets shared on my timeline multiple times each year. And, without fail, it gets shared like wildfire. As of 8/4/15, a recent instance has been shared almost 80,000 times. Ridiculous. But, it means that those of us that yearn for the powder are hungry for information. So, I decided to do the logical thing and conduct a little research, reaching out to Cory Reppenhagen, a meteorologist for 7News in Denver, and he knows a thing or two about powder. Cory is a storm-chaser throughout the summer, and I first met him unloading at the top of Wolf Creek Pass during the 100-inch storm in February of 2015. Cory, with all of the hype, what’s your take on predicting what our winter is looking like? When I hear about a pending super El Nino, I get exited like every other powder lover in the country, then I remember that I’m a scientist, and I have to deal with statistics and reality. That’s not all bad, I just have to keep grounded a bit. El Nino means there is a changing weather pattern coming this winter. That change is not likely to occur in the core parts of the Rocky Mountains. 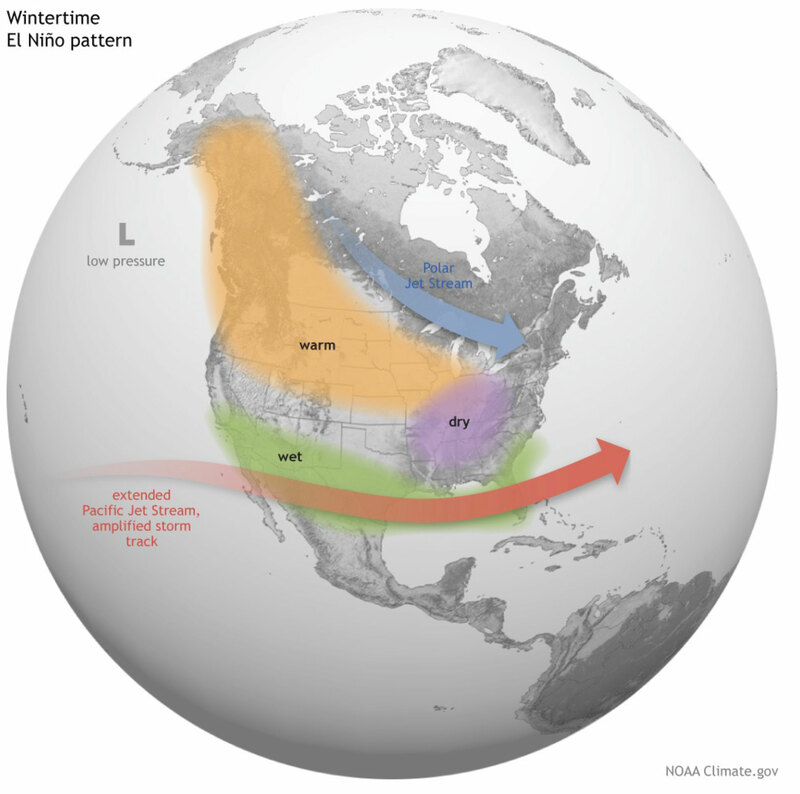 The graphic below shows the actual effect of El Nino on the American Winter. The stronger the El Nino, the further south the storm track is likely to go. That means the mountains of New Mexico, Arizona, and California have the best shot at big snow. We will likely be dealing with a near record breaking El Nino this winter, and it could even break the record El Nino of 1997-98. NOAA says there is an 80% chance the El Nino will last all the way into the early Spring. The terms ‘Godzilla’ or ‘Monster’ El Nino are deserving titles, but don’t make the mistake of attaching them to the phrase ‘Snow Season”. Here’s a great comparison of some El Nino events, and what that has meant for average precipitation. The fact is, El Nino does not change the outlook for overall winter snow in the bulk of the Rocky Mountains, but it does favor big events, especially in Fall and Spring. That’s something you can look forward to and need to be ready to pounce on. For instance, the 1997-98 record breaking El Nino got off to a roaring start. 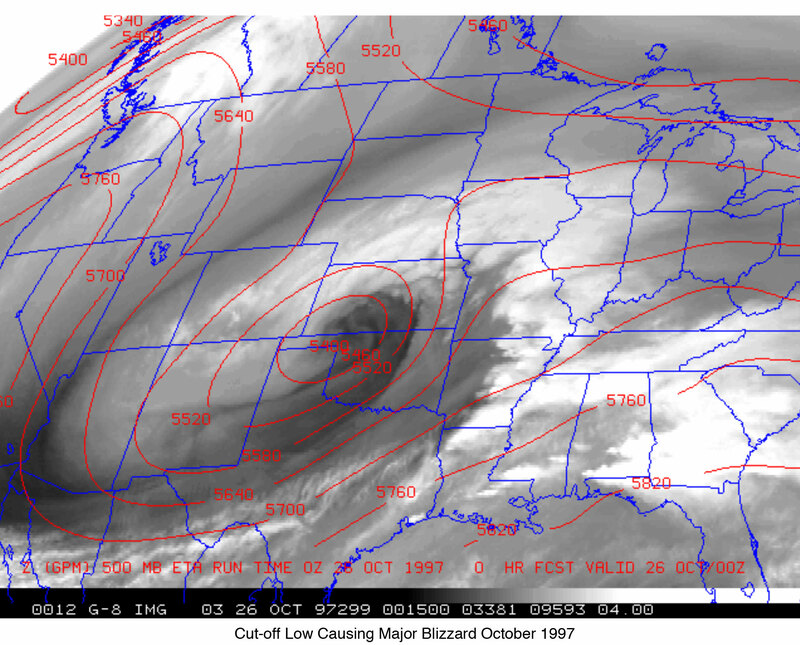 A tremendous snow storm struck October 24-26th in 1997. It blanketed several states and the Denver metro was left with 14-31” and 24-48” in the Colorado foothills. It ranks as the 7th biggest snow storm to ever hit Denver. Then the Rocky Mountains went on to have average snowfall for the rest of the winter. We know that El Nino’s favor Fall and Spring snow, so start getting your gear together now. NOAA’s official Winter Outlook usually comes out in mid October, and we may already have a major blizzard under our belts by then. The bottom line is, Winter is coming. And there will be cold temperatures and snow. You will likely be a happier snowmobiler this year, after what most consider to be a pretty Cut-off Low Causing Major Blizzard October 1997 dismal winter last year. Just don’t go around thinking that a super El Nino will result in the entire country being covered miles deep in luscious powder. That would be sweet if it did, but we’ll just have to settle for slight improvements. Here’s a region by region breakdown for ya. It takes a combination of favorable circulations and oscillations to change Colorado’s winter. It’s as close to reliable as you can get. El Nino does favor the San Juan’s in southern Colorado, and a little drier in the north, but the deviation from normal is not large. Should see an improvement over last years weak showing statewide. The 4 strongest el Nino’s have brought above average snowfall to Utah. Expect that to be the case for this winters event as well. 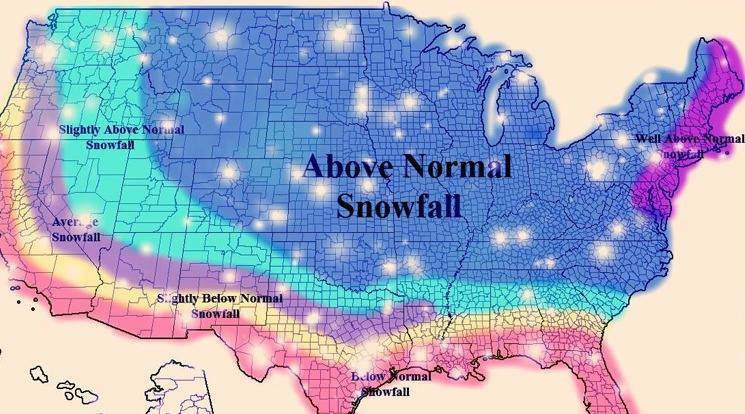 Very favorable for above average snowfall here. That might not be saying too much because average snowfall in these states is not high, but with cooler temps, that snow could stick around and end up pretty impressive. If you’ve never done a trip down south, this winter would be the winter to give it a go. The Sierra Nevada’s have been big winner’s in 5 out of the top 7 strongest El Nino’s. They need a big year in the worst way and it looks like they’ll get it. Mammoth is back! This is probably your biggest wildcard. 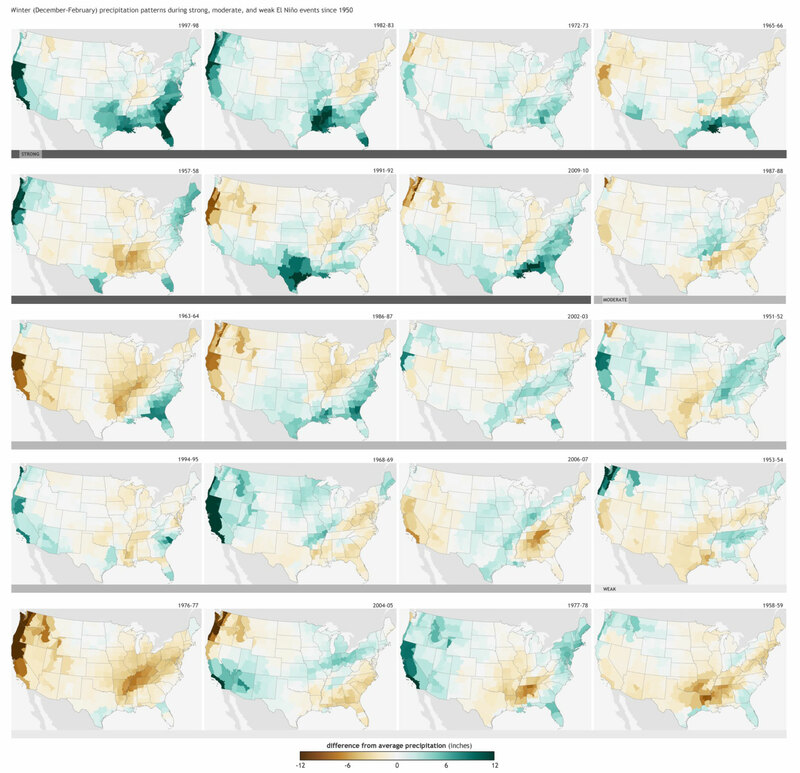 Winter precipitation can fluctuate and vary wildly here; with or with out El Nino. The 2 strongest El Nino’s historically have been good to this region. El Nino typically means warmer than average temps and below average precip here. this is another area that is usually right near normal numbers for snowfall. strong El Nino’s of the past. 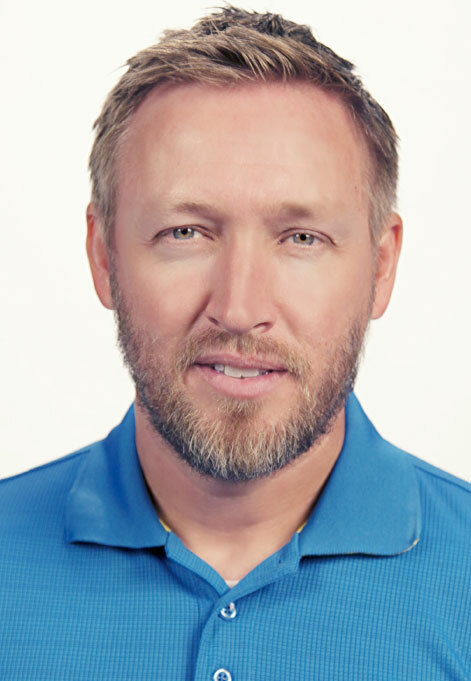 Cory Reppenhagen is a Meteorologist and Storm Chaser with KMGH 7News in Denver. He received his B.S. in Geosciences from Mississippi State University. During his 20 year stint in local television, he won a regional Emmy award for his coverage of the April 2011 tornado outbreak in Alabama, was at landfall for 20 tropical systems, and flew a hurricane hunter aircraft into the eye of the strongest hurricane ever recorded in the Atlantic Basin (Wilma Oct 2005). His hobbies are photographing tornadoes and hiking, and his winter sport of choice is snowboarding.